Wouldn’t you just like a pasture full of alpacas that look like Paityn? Her striking head type is complimented by her very square frame, thick bones and extreme coverage. As we think back on her pedigree there is no wonder why all these traits are visible. 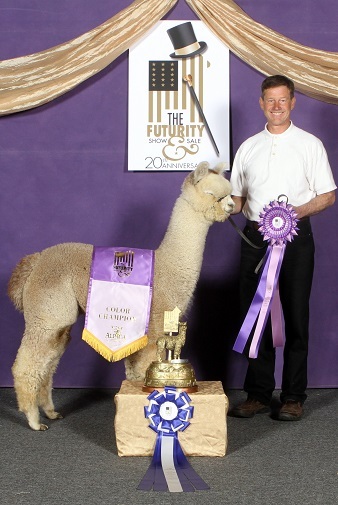 Her family tree is loaded with alpacas we owned and bred and who themselves had these components. Along with her curb appeal, Paityn has a lovely fleece. It is rich in color with excellence in all categories. 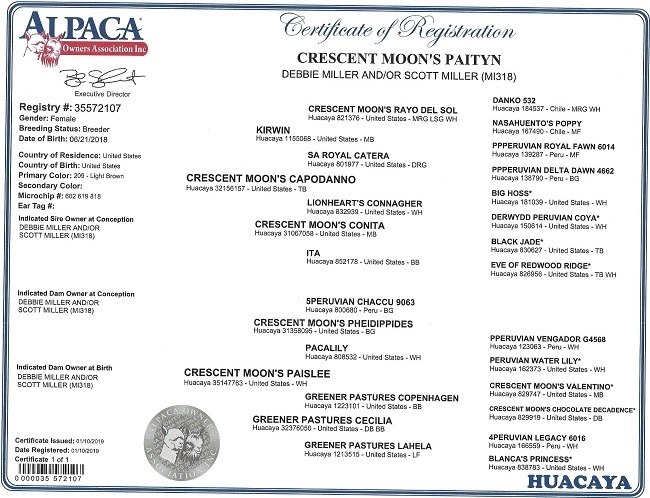 Paityn’s first breeding will be completed at Crescent Moon Ranch. We would likely select Emmaus for that first breeding, but of course, we will respect your wishes. Paityn’s first pairing is non transferable.